FILE – People walk past the Federal High Court building in Addis Ababa, Ethiopia, Nov. 1, 2011. Observers say Ethiopian courts frequently use the country’s anti-terrorism laws to restrict activities of government critics. From an internet shutdown to convictions of journalists and opposition members, Ethiopia’s civil society has felt like it’s under attack in recent weeks. On May 24, Getachew Shiferaw, editor of the news website Negere Ethiopia, was convicted of “inciting violence” because of a private Facebook conversation. The Ethiopian Federal Court initially charged Shiferaw under the country’s anti-terrorism law, but later charged him under the criminal code and sentenced him to time served since his arrest in 2015. “Yonatan is sentenced to six years and six months just because of what he wrote on Facebook as something that encourages terrorism. He was expressing his thoughts freely. This is what we fear would bring people to protest in our country,” he told VOA. 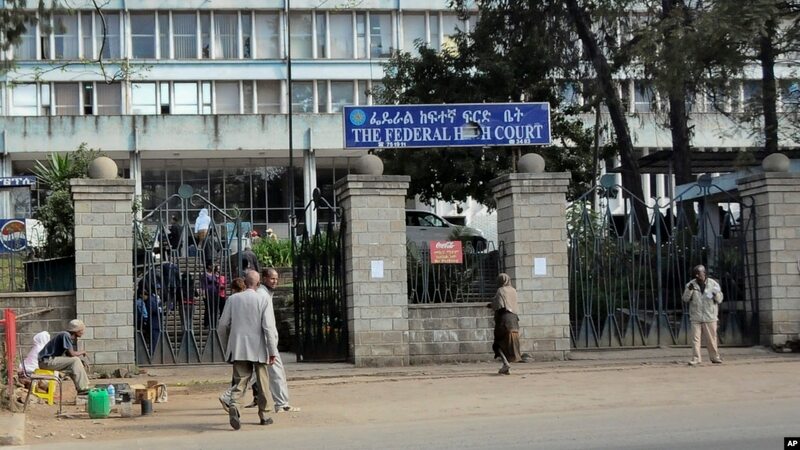 The following day, May 26, two men, Tufa Melka and Kedir Bedasso, were charged with terrorism for their role in a stampede that occurred in October 2016 at a cultural festival in the Oromia region. The men are accused of yelling things into the microphone that led to chaos and the death of 55 people. Gemeda Wariyo, a protester who grabbed the microphone and admitted to chanting “down, down Woyane” is in exile now and wasn’t mentioned in the court documents. “Woyane” is a colloquial term used to describe the ruling party in Ethiopia. 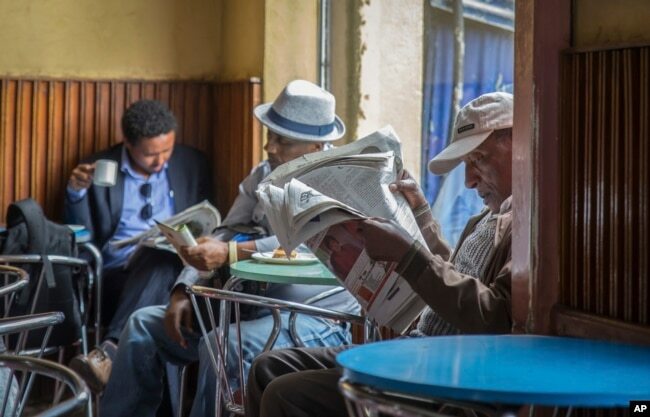 FILE – Ethiopian men read newspapers and drink coffee at a cafe in Addis Ababa, Ethiopia, Oct. 10, 2016. The Ethiopian government temporarily cut off internet access nationwide in early June, saying it was necessary to prevent students from cheating on final exams. And in early June, the government cut off internet access nationwide, stating that the measure was needed to prevent high school students from cheating on final exams by sharing answers on social media. In a press conference, Communications Minister Negeri Lencho denied the move was to control free communication. “The only reason is to help our students to concentrate on the exams because we know we are fighting poverty,” he said. As of June 8, internet access including social media sites was restored, according to published reports. In a new report, the Carnegie Endowment for International Peace, an international think tank, concluded that the targeting of civil society and restrictions on free speech fit a pattern in Ethiopia. Over the past two decades the space for political opposition has been steadily constricted and civil liberties taken away, the report said. Two laws in particular, the Charities and Societies Proclamation and the Anti-terrorism Proclamation, both passed in 2009, have given the government wide latitude to imprison opposition members and journalists and shut down groups advocating for human rights, Carnegie found. Saskia Brechenmacher, an associate fellow at the Carnegie Endowment who worked on the report, said anti-terrorism laws have been used across Africa to stifle dissent. FILE – Security personnel take action against protesters in Bishoftu town in Ethiopia’s Oromia region, Oct. 2, 2016. 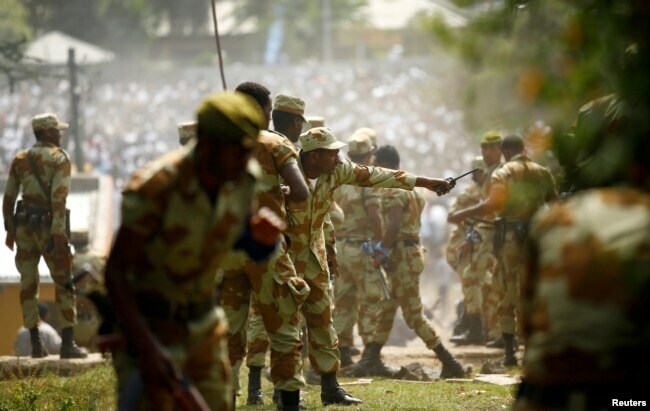 Critics say that ahead of elections or during moments of sustained protests the Ethiopian government has been known to resort to a self-serving interpretation of the country’s anti-terrorism laws to stifle dissent, selectively targeting activists and journalists. Brechenmacher said Ethiopia also cracks down on civil society groups through a provision in the charities law, which prevents organizations from receiving more than 10 percent of their funding from abroad. “Many organizations had to switch their mandate and activities and turn more toward developmental and civil liberties because they couldn’t carry out the kind of work they had been doing before,” she said. Brechenmacher said these restrictions represent an abrupt reversal for a country that was becoming more open prior to the crackdowns that followed the 2005 elections.